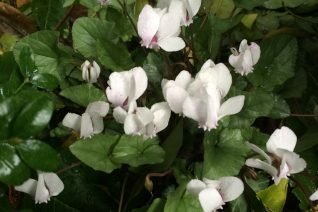 Winter Cyclamen is a fantastic adaptable bulb that will form impressive colonies in time. The fabulous leaves are marked with silver and deep green designs. 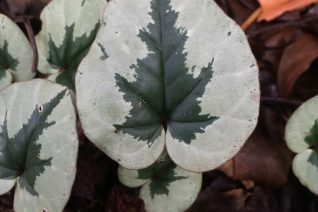 This form is known as the ‘Christmas Tree’ for its shape on the rounded leaves. From January to March small nodding purple/pink flowers form groups in concert with the foliage. A tonic for winter. To just 4″ tall in bloom and each corm gets bigger and bigger as years pass. Ants spread the seeds far and wide and new plants appear quite a distance a way. If you begin with a fancy leaved variety chances are most of your seedlings will mimic the parent. Part shade to shade in rich, well drained soil. Goes dormant and can tolerate completely dry conditions in summer. Excellent companion for winter Crocus, Hellebores, Snow drops.